Have you ever stopped to think about the fact that today’s parents are breaking new ground in the whole parenting thing? After all, parents have been parenting for as long as humans have been raising kids, and that’s a mighty long time! However, for the millennia of human parents before us, they had the advantage of knowing at least a reasonable amount about their kids’ futures. What was going to keep them alive. What their place in society would be. What skills would be needed by their community when they grew up. And until the last 150 years or so, they raised kids as a village. For the first time in humanity, we can honestly say that we have absolutely no idea what is going to happen in the next 5 years, let alone in the next 20! How do we prepare our kids for a world in which we are unable to predict the future? We can’t just teach them what our parents taught us, because that’s not going to work. Our kids need a new skill set – one that gives them the skills to innovate, experiment, explore, create and adapt. They need to be able to cope with setbacks, take charge of their own destinies, develop their own special gift that they have for the world. 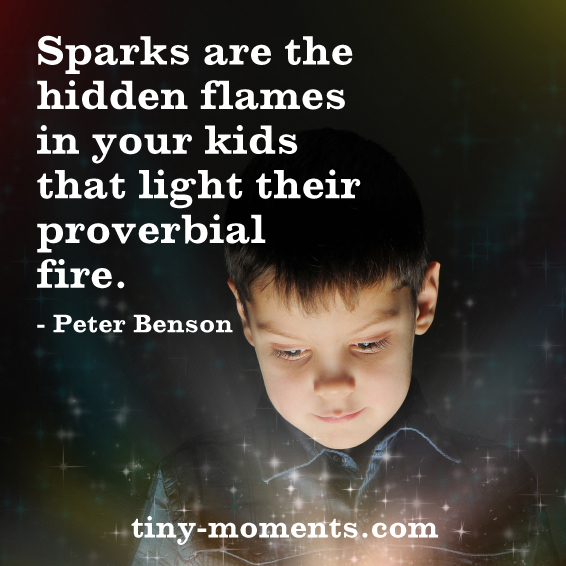 So why am I taking it upon myself to share ideas and information about nurturing kids’ sparks. After all, I don’t have a crystal ball. I don’t know if what Hubby and I are doing to raise the Munchkin is going to work out for him in the end. I’m just listening to my gut, and doing the best I can. I’m guessing you are too. Mostly, it’s because I strongly believe that someone has to, and it might as well be me! As a designer, an entrepreneur and a generally all-round creative type person, I believe I know a thing or two about creativity. I’m also intensely curious about psychology and childhood development, even though I’ve never formally studied them. Plus I have one of those completely “out-of-the-box” kids. He’s the type who, when you ask an adult who knows him well, the best description they can come up with is, “He’s just ‘The Munchkin!’ ” (OK, they use his real name, but you get the idea.) There really is no other way to describe him. He may be an absolutely delightful 8 year old (most of the time), but he is NOT an easy child to parent (or teach for that matter!) He is so bright, sensitive, spirited, imaginative and active – and that’s just for starters. He picks up on every detail, he feels things intensely, he thinks about things deeply, he has his own ideas about EVERYTHING and his energy is boundless (until he crashes at the end the of the day). In short, we simply can’t parent him on auto pilot! We’ve had to learn better ways to handle every parenting situation, from diet to discipline, media exposure to choosing a school. Not all the ideas I share here will work for you and your child. After all, each child is his/her own unique self, as are you. However, I believe that we don’t need to do this parenting thing alone. Through online and real life communities, we can share our knowledge, our ideas, our discoveries. We can be creative in our parenting and hopefully, be more fulfilled in our own lives too. I’ll share my findings. You share yours. We’ll learn from each other. Together we can raise great kids for the global village that is our connected world. This is The Kid Spark Project.